Have a question on M5 Sedan? M5 Sedan is available in 9 different colors - Black Sapphire Metallic, Alpine White, Singapore Grey, Donington Grey, Blue Stone, Champagne Qurtz, Almandine Brown Metallic, Marina Bay Blue Metallic and Snapper Rocks Blue Metallic. Watch latest video reviews of BMW M5 Sedan to know about its interiors, exteriors, performance, mileage and more. The legacy set by M series, M4 in particular, is well carried forward another milestone by the new M5 which is oriented towards delivering a great deal of performance. Keeping the environmental aspects in mind, BMW M5 has given up on its V10 power for lesser count dynamics with turbocharging, the first step towards a more responsible future. 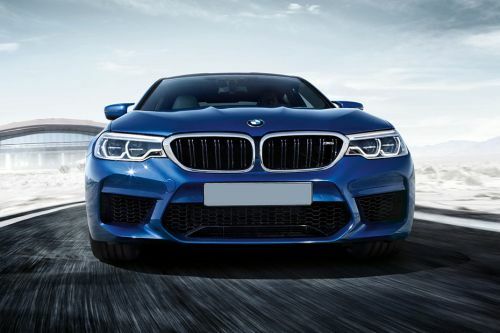 One may imagine that BMW M5 is developed with a smaller engine but, the power and torque delivered by the engine will clear the dilemma in an effective manner. The superior efficiency and outstanding performance is the result of newly defined 4.4-Litre V8 petrol engine that churns out maximum power of 560 Hp between 6000 to 7000rpm along-with the maximum torque of 680 Nm between 1500 to 5750 rpm. The M servotronic transmission adapts steering power and resistance inline based on the driving speed. The stylish sedan takes just about 4.3 seconds to acquire the speed mark of 0 to 100 kmph, while the top speed stands electronically limited at 250 kmph. With the latest face-lift, the fuel consumption has taken an uphill turn as well. This amazing car delivers the fair mileage of 9.9 L/100km with CO2 emission as low as 232 g/km. An elegant athlete whose impressive prowess is apparent at first sight. The designers have make sure that the car is designed by incorporating highest standards as a yardstick. The M double kidney grille accompanied with Adaptive LED headlights reveals the striking character of a powerful robust. The horizontal contours of the muscular side sections and the distinctive crease lines reflects the aerodynamics of the vehicle on road in a significant manner. The overall dimensions of the car measures 4910 X 1891 X 1467mm (L X W X H) and the wheelbase measures 2984 mm that makes ample cabin space for the occupants. The 19-inches alloy wheels are equipped with tyre size measuring 265/ 40 R19 in front and 295/35 R19 in rear. Motorsport experience with a pleasant ambiance within, the interior of M5 is ideally geared towards perfectly controlling the tremendous performance of the sports car and at the same time enjoying each kilometer to the fullest. M leather multifunction steering wheel, high quality M leather seats, advance air conditioning system, all together adds to the comfort of the car. The 8.8-inches touchscreen for MMI Navigation coupled with Bang & Olufsen high end Surround Sound System with 16 speakers can convert the car into a concert hall in fraction of seconds. The boot space of 520-Litres further makes enough space for carrying luggage and adds to the practicality of the vehicle. In order to provide maximum protection to the occupants and the other road users, BMW M5 is loaded with an array of active as well as passive safety features. To give a highly excellent driving experience, the BMW M5 is installed with M Carbon Ceramic Brake system and M compound brakes ensuring inimitable dynamics as well as performance. Accentuating its dynamic braking system, this sedan is provided with Anti-lock Braking System (ABS), Electronic Brake Force Distribution (EBD) and Electronic Stability Program (ESP) that improves vehicle’s stability effectively. In order to offer maximum stability in diversified situation the saloon incorporates M suspension, which offers optimal road contact providing best possible traction ensuring agile handling. M5 is a sedan that has set a benchmark for other premium saloons and delivers an unmatched performance in each aspect. BMW M4 has pulled up a fascinating customer base, and the M5 with its extended dynamics only carries this legacy forward. What is the price of BMW M5 Sedan? On road prices of BMW M5 Sedan 4.4 L in is costs at AED555,000 . What are the colors options available in BMW M5 Sedan?